Take your 1 of your brown pipe cleaners and cut it half. Then cut those two pieces in half. Now you should have 6 small pieces. Stick them in the top of the cup. Just poke them down in there. Bend them down or position them how you would like for her hair. Do the same cutting technique with the other 2 pipe cleaners and stick those in. Now take your yarn (we used multi- colored yarn) and wrap it around the bottom of the cup for her shirt. 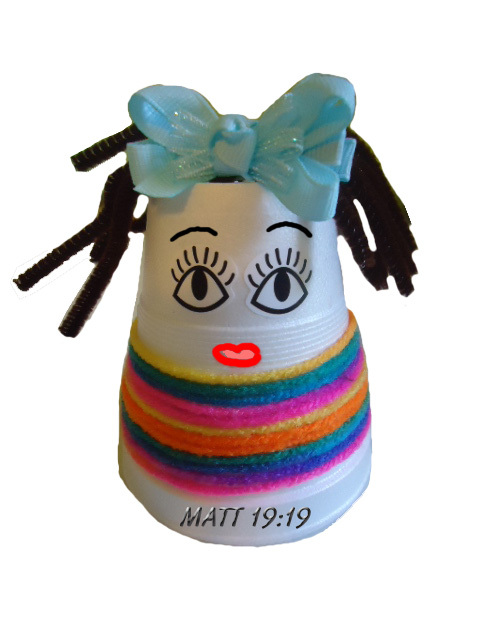 Be sure to leave the bottom rim of the cup exposed so you can write the scripture Matt 19:19 on it. Use some tape to tape down the yarn in the back. Stick your eyes on if you are using stickers. If you are using google eyes then glue them on. Draw your mouth and eyesbrows on. Add a bow. You can make your own out of the same yarn and just tie it in her hair or you can buy bows in bulk at walmart. Now get your black marker and add that scripture down at the bottom. Have the kids give this to their mommy for Mother's day.